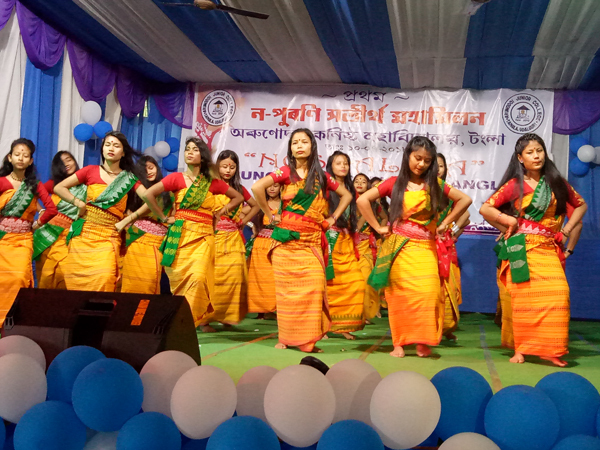 A junior college in Tangla celebrated its alumni meet with fanfare on Tuesday. People from villages and small towns chase big dreams, they chase their fantasies, work hard with determination and taste success. Most of the successful people in the world who have established themselves comes from villages or small towns, this was an observation made by Journalist and Editor of News 18 Axom NE, Paragmoni Aditya. Aditya attended the first Alumni meet of Arunodoi Junior College, a private sector college here at Bordoloi Bhawan in Tangla on Tuesday. Speaking at the meet as the chief guest he further exhorted the students to determine their goals and work hard with dedication to achieve them. “The crucial period of academic life should be utilized in a proper manner to climb the ladder of success.”, said Aditya. He also exhorted the students to judiciously use social media sites along with appealing them to uphold moral and social ethics in their life. Earlier the day long celebrations began with hoisting of flag, plantation of saplings, a cultural rally which was followed by an open session where the souvenir- ‘Pantheon’ was inaugurated by Bhergaon SDO(C) D. Hazarika. The session inaugurated by Principal of the institute, Pranabjyoti Das was attended by a host of former students from different parts of the country. In the interactive session the alumnus reminisced about the nostalgic moments of college days. A cultural programme was held on the occasion where the alumni sang popular numbers danced together. A fashion show and cultural night is also scheduled for the evening.